There’s plenty up in the air right now given the proposed UCI reforms, their rejection by ASO and all the uncertainty ahead but since this is about a theory, let’s run with it. The idea is that if 18 teams or less apply for the 18 World Tour spots then all is well but the moment another team applies the equilibrium is broke with consequences for teams, tactics and wages. There are four criteria for a team to get a world tour licence: admin, financial, ethical and sporting. The first two relate to paperwork and adequate funding, the third is nebulous and undefined but relates to being sporting and clean and the final “sporting” criteria is the subject of this post. 2.15.011 b For any other team applying for UCI WorldTeam status, the sporting criterion is evaluated on the basis of the team’s five best-placed riders on the «UCI WorldTour individual ranking» for the season just completed. The two teams with the highest points totals for their five best-placed riders on the said ranking shall be considered to have satisfied the sporting criterion. So as you see the 17th and 18th team plus any new applicants are judged on the points of their five best riders. A team can either submit its classification based on its actual rankings in the year past or submit a synthetic version based on their new signings from the upcoming season. This is a curious system because a team that suffers an exodus of talent can still qualify based on the points of their departing riders but it also gives teams on the rise a chance to submit their case based on riders they’re signing. Either way the last two teams in the table are judged on their points alongside the new teams applying for a World Tour licence. Which teams could take the next exit? Astana should move up given Vincenzo Nibali and Fabio Aru are likely to feature in the Giro and Tour this summer but the likes of Ag2r La Mondiale, IAM Cycling, Cannondale, Lampre-Merida, Lotto-Soudal, Lotto-Jumbo and Trek Factory Racing may be nervous here. All it takes is a run of results for a couple of teams and they’re suddenly at the foot of the table. Now they’re looking over their shoulders and thinking about hiring riders with points and trying to secure points. This brings us to the tactics. 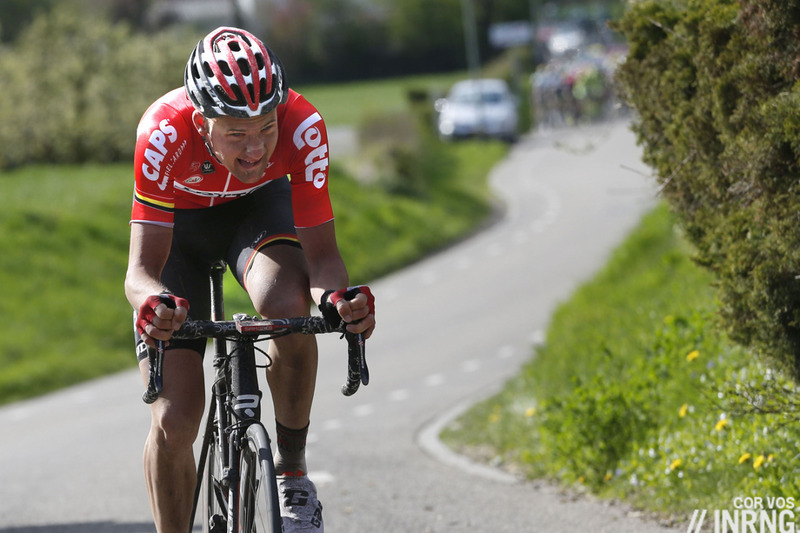 Tim Wellens was a star of the “Ardennes races” thanks to his willingness to attack but as we know it brought no big results. He got a good tenth place in the Amstel but had he sat rather than trying a late breakaway then he could well have placed higher. As such Lotto-Soudal could be inclined to tell him to tame himself and settle for some points, to “take one for the team: if you like. Wellens is a handy example but this mentality can spread across other teams. Longshots that are unlikely to deliver a points pay-off become less attractive to team managers. Similarly riding conservatively in a stage race can pay dividends, when Nairo Quintana attacks there’s no point trying to match him, better for some to sit tight and see if they can crack the top-10 and bag some points. There’s a potential impact on wages too. As the rule above makes clear only a team’s five best riders count. It used to be said that domestiques were becoming selfish as they tried to snipe points here and there for selfish reasons but this was in the days when lots of riders counted to a team’s ranking. Now only five riders count a team can have 25 other selfless servants without a point between them and it won’t matter. So having a point or two doesn’t matter but having a handful does. A team worried about their position needs to sign someone with points and chances are those facing relegation cannot sign a superstar to save the team, instead it’s spreadsheet time as they start weighing up the value of signing, say, Lieuwe Westra, Aleksejs Saramotins or Imanol Erviti – all cited as they have 250 points each, a respectable haul. Don’t focus on this trio but this kind of rider, a team’s fourth or fifth ranked rider. As a result the moments points matter for a team is the moment riders with enough points can cash in. Which other sports see the No. 1 ranked team due to stop at the end of the year? Of course Tinkoff lead the table right now and are set to vanish as there’s no news on a replacement sponsor so the UCI needs to find an 18th team just to fill the existing slot. Given the politicking at the moment it’s questionable whether a team would apply for a World Tour licence. ASO has said it will pull its races out of the World Tour meaning a team doesn’t need a World Tour licence to ride the Tour de France and also the UCI has said it’s got new races applying for the World Tour but has yet to say which races are involved meaning a team and its sponsors don’t know if they’ll reach valuable markets like Germany, the UK and the US in new races or if they’re compelled to go and race in Kazakhstan or Norway, or some other less prosperous market or a small nation with a proportionally small market. Yet all it takes is a Bahraini billionaire to give the go-ahead, a Danish tycoon to get on board with Bjarne Riis and so on and the equilibrium is broken and there’s a scramble for points. This reality allows us to reverse all of the above. If points are not going to matter this year then perhaps Wellens and Co. are allowed to attack, that riders with a decent haul of points but little star factor are valued like this rather becoming prized signings for hidden reasons and teams can sign the riders they want as opposed to chasing the riders they need. This reached its nadir in years past when Lotto and Ag2r started signing Iranian riders for their points and sadly this was not a bet on fresh talent but desperation for points and the teams went shopping around the Asia tour. Things are calm now. It was not long ago that UCI points were a very precious currency but these days they’ve been devalued because of the lack of competition for a place in the World Tour. In recent years the UCI’s made overtures to smaller teams to join the top flight in order to fill the empty spot. Right now the looming exit of the Tinkoff team and the UCI vs. ASO spat means there’s no panic among teams nor a rush of sponsors into the sport. But all it takes is one more ambitious team and suddenly a tipping point is reached, the plans of 18 teams are altered because of the arrival of one more and if this scenario isn’t rushing towards us, it’s still worth exploring the theoretical consequences: wages can rise for some and fall for others, team tactics get safer and managers make some signings based on points rather than promise. Put this way it sounds negative, defensive and unwanted but since this scenario is only theoretical for now does it mean we’re seeing the opposite with risk-taking tactics and recruitment for all the right reasons? If the tour keeps out of the WT seeing WT might even be worse for a modest team, since ASO cannot call all WT teams even if it wanted. Only the UCI would encourage their sport to be more dull. How wonderful to have teams pick riders based not on talent, but on spreadsheets. Do points acquired from lower levels count for less? 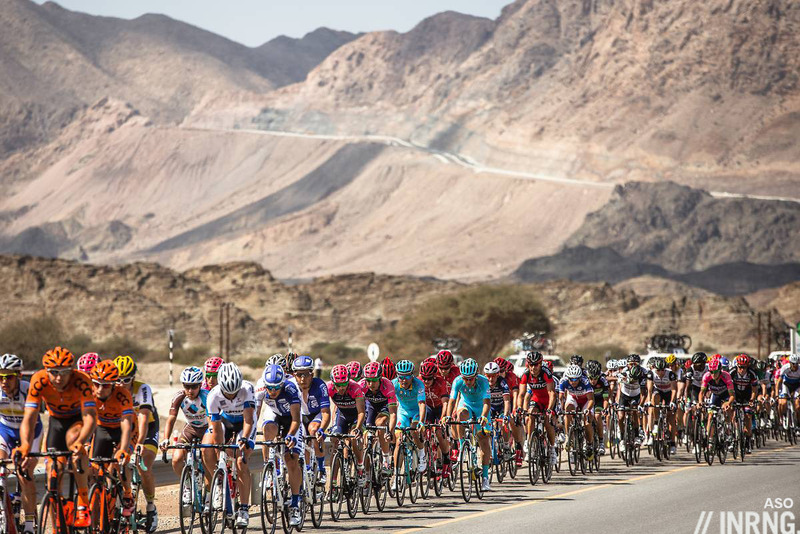 You’d assume they would, but this is the UCI… and presumably those teams signing Iranians knew what they were doing. – So, the teams get to choose which they use, depending on which gives them a higher tally? Doesn’t this mean that a rider could be providing points for two teams – old and new? The least they could do is just have the points stay with the team – and not the rider. That way, domestiques aren’t punished for having no points. Or maybe spread points between all riders who are in a team with a race winner. But then, really, it’s so artificial as some riders will help more than others. And this points system means you end up with riders even less likely to be allowed to ride after August 1 because the team can’t use their points – unless, of course, the team is going by the old year’s results! A shambles, which surely no-one has missed. And this points system means you end up with riders even less likely to be allowed to ride after August 1 *if they’re changing team* because the team can’t use their points – unless, of course, the team is going by the old year’s results! To be fair, it’s hard to think of a team sport that doesn’t hire based on ‘spreadsheets’. Whether that’s stats (take it you’ve noticed all those guys with GPS devices under their shirts) or their ability to make money for the organisation. What’s ridiculous is using points of a rider who has just signed for the following year. Imagine a football team who’s to be relegated being kept up based on making some big transfers! Can’t see what’s wrong with spending a season in pro conti and coming back up based on the results of the new riders. Come on J, the UCI are just following the F1 lot in their attemps to make racing duller! Also, if it’s the top 5 riders, isn’t it possible that Team A could have far more points than Team B, but be lower down because its points were spread between, say, 8 riders? This is not only possible. It happens. 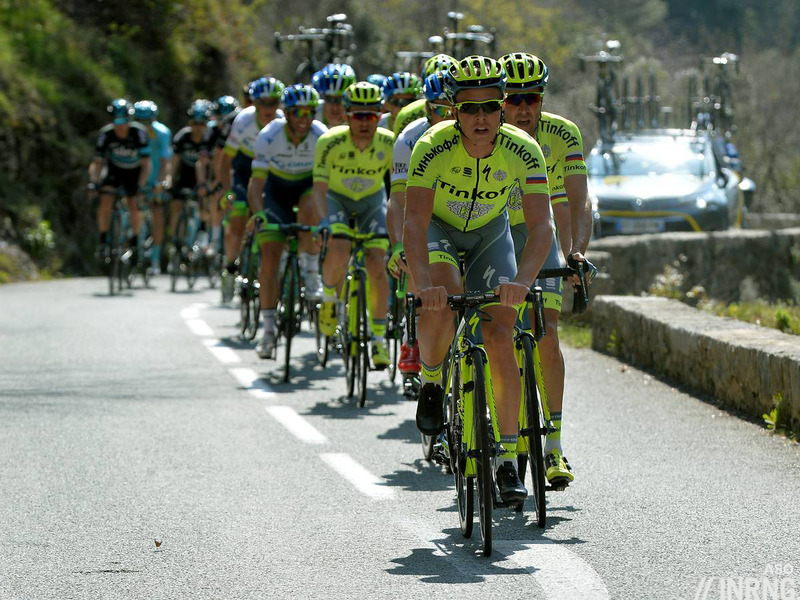 Tinkoff are the top team because of their two superstars, Sagan and Contador. Sky have far more total points spread between more riders. But only the top 5 riders count for the team standings. This means, for example, that Ben Swift’s podium in Milan-San Remo does not count towards Sky’s total because he is not one of their top 5 scorers. Wouldn’t Giant-Alpecin get some kind of special dispensation considering how much of their roster was wiped out in injury because of the accident? Their problems are unique but there’s no clause in the rules to allow this. Then the rules are weak. Should at least be some form of provision for calamities. Weak or maybe that no-one envisaged circumstances where half a roster would be wiped out for a substantial period of time? It’s difficult to draw up an exhaustive rule-book which runs through a gaumut of possible but unlikely scenarios. I think most people would argue that some sort of discretion should be applied but through discretion can come inconsistency. INRNG, are there are any rumours of teams wanting to move up yet, aside from the Riis project and the Bahraini-backed team? I know Tinkoff are proposed to cease unless backing comes in and I keep hearing rumours that IAM are wobbly. It wouldn’t need to run through a whole gamut of possible calamities, just have contingencies in place in case of calamities. Wouldn’t need to be specific. That is way too thoughtful a concept for the UCI. ONE Pro Cycling want to move up and apparently have a big sponsor lined up. Cycling badly needs a franchise system. We go through this every year and I can only imagine how unpredictable and insecure it feels to riders–espcially neo-pros or lesser riders who could lose their jobs and career without warning. Agreed Sam. And also, why can’t riders keep the same race number for the season? It would make it so much easier to pick them out if they all had their number printed somewhere clearly visible on their jersey. Bonus for the riders would be not having to pin race numbers on – winning! I’m struggling to think of another team sport where the athletes change numbers every single race/match. Or maybe even print names on the jersey? IAM tried it, the UCI fun police didn’t approve. IAM’s problem was printing the names in the wrong place on the jersey, there’s a block on the jersey that’s supposed to be for sponsors but you can put names elsewhere. Side of the sleeve or armpit down the body; but the UCI has to drive this, not an individual team. But how many team sports need unique numbers across different teams? It’s not an apples with apples comparison. Of course I’m not saying it’s not possible – I’m pretty sure there are enough numbers out there to make it happen. Totally agree, as i get into cycling more and more it’s much better to watch if i can identify riders easily – national jerseys stand out, as do the race ones but – they confuse my dad when he watches with me and cant work out who is working for who. Numbers would be so much better…. c.30 riders per WT team, 18 teams only 540 teams, the pro conti ones can stick an A,B,C etc in front of theirs (dependant on the continent) and work up again. Also, the technology surely exists to tell us who riders are automatically on the screen. I’m not exactly a technology maven, but sometimes it’s a good and simple solution. Honestly, a 1 thru whatever for each trade team. It’s not like #1 in a SKY kit is going to be mistaken for a #1 in a Cannondale kit. You could even give the support staff #s. The most arrogant CEO of a sponsoring company could have #1. Training ride jokes abound. There are advantages but disadvantages too. It gives incumbent teams power over outsiders. Had this existed a few years ago several small teams could not have grown from a small start into something bigger, eg Skill to Giant-Alpecin, Chipotle to Cannondale etc. Naturally, but wouldn’t it also mean it would have skipped the laborious “build” stage and past teams, for example Highroad, would presumably still be around? Brilliant, insightful and conclusive article, thank you, Inrng! In regards to it effecting attacking riding, would it hold true that a rider who is thinking about points during the heat of battle, would be unlikely to be an attacking rider anyway? On the assumption that attacking riders aren’t conservative by nature and non attacking ones are, when the possibility of future points are taken out of the equation, would a rider suddenly ‘change their spots’ and all become incarnations of Timah? The tactics do seem to vary, Tiesj Benoot for example was reined back from some attacks this spring in order to secure some points. Partly this is race craft, knowing how to save energy but there are team orders here too. I was trying to emphasis the opposite, and not very well, but a rider with attacking instincts, as you say, can be held back by the team or tactically decide not to attack. It’s the negative type of rider I was interested in and would no WT points at stake really make any difference to their riding? Therefore would we suddenly have a cornucopia of exciting races because the system was changed? It is interesting to compare Tim Wellens with Steve Cummings. It can work but you need to have the experience, I guess. I think the peloton understands full well that since his big crash Cummings is nervous about riding in the wheels, particularly descending. Hence he prefers to ride at the back until he is ready to attack. Unfortunately this means he is not very useful as a domestique. Which was an issue at Sky but a smaller team like DD are happy to give him a free rein. Last year’s TdF stage win set him up nicely until retirement. It helps that he is a very popular, quiet spoken guy (and a pretty damn good DJ). It’s also been a deliberate tactic of Qhubeka/DD to have someone at the back of the peloton, to get the shorts sponsor on TV. Cummings is often the man for this. Andrew – that’s something I hadn’t appreciated…. So everyday is there a race to get in the break, and an inverse race to be man at the back with your arse in the viewfinder! To me one positive in the UCI vs ASO spat could be (finally) the demise of the stupid World Tour idea? It was dumb when dreamed up and it seems to get dumber every year. If I was king of pro cycling and wanted to please those who wish for some sort of top-tier system (why this is important escapes me) it would be 12 teams with REAL financial and ethical/sporting requirements to automatically get invites to all the big races, but with 6 wildcards of the promoter’s choice. 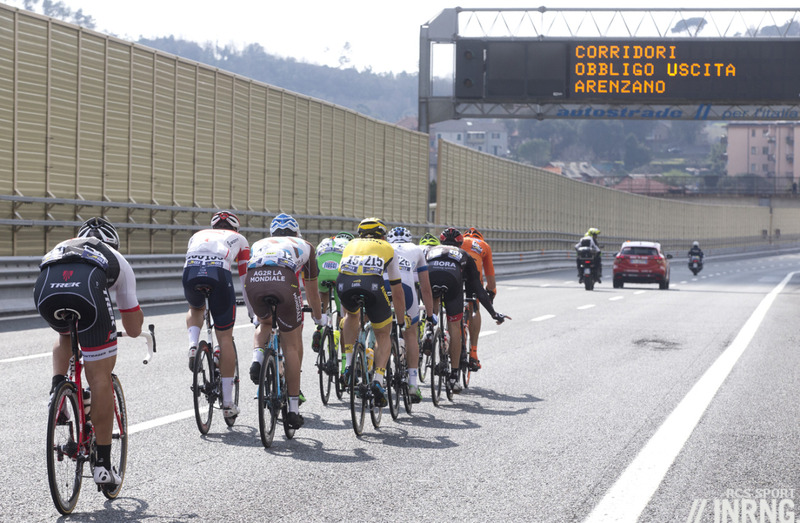 One might have a real battle to get into the top dozen, unlike the joke of 18, the promoters would have no problem bringing local teams into their events and the resulting peloton would be a more manageable size – 18 X 9 = 162. Yep, I’d happily ditch the WT: the individual races stand alone anyway. Lieuwe Westra, Aleksejs Saramotins and Imanol Erviti have 250 points in the UCI World Ranking not the UCI World Tour Ranking. Have I misunderstood? 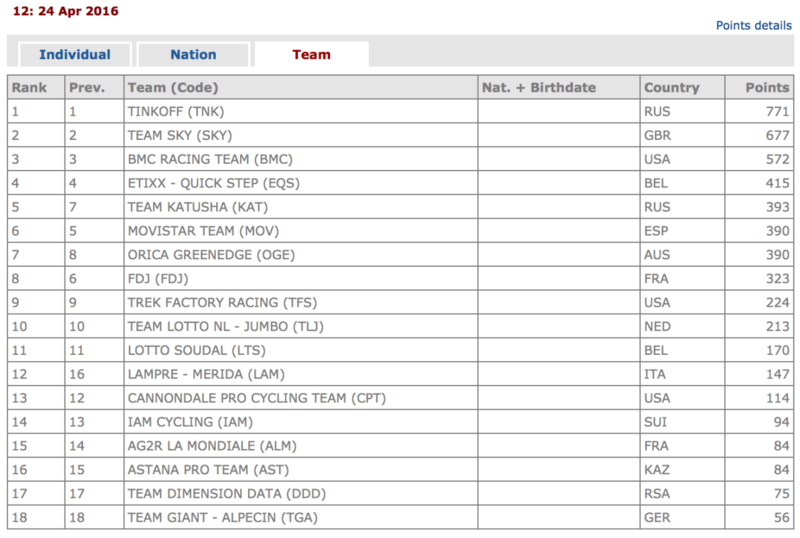 Basing it on the WorldTour ranking rather than the World Ranking seems harsh for teams not currently in the WorldTour. Ironically, though, while ASO claim to want to maintain an “open” system (i.e., promotion and relegation) to reward sporting success, as you rightly note such a system rewards the riders picking up minor places here and there. Whereas a “closed” system allows for attacking, exciting riders with less fear of relegation. According to PCS, Erviti has 40, Saramotins 20 and Westra 0 in the WorldTour Individual Ranking (which is based on this year, not a rolling year like the World Ranking, I think). Not so, Inrng. Different systems, different counting, different criteria. If Westra was on 250 no matter what, then why have Astana in total only got 84 in that table? If Saramotins is on 250, then how have the whole IAM team only got 94 points? Tov is correct. For the purposes of working out whether or not those three riders, that kind of rider, would be hired by a team looking for World Tour points, the relevant numbers are 40, 20 and 0 rather than 250 each. It seems that the problem is that if you have a franchise system it greatly reduces the prospects for new teams to join the WorldTour; but if you have promotion/relegation the points system encourages conservative riding. Perhaps a compromise of promotion/relegation every three years, rather than every year, would give teams a bit more stability, whilst allowing new teams to ascend, and give a better idea of teams’ long term performance. The points should remain only with the teams – not the riders – so the team benefits from its performances and the riders’ value, contracts, etc. are not affected. They could also skew the system so that much more points are awarded for victory than for placings. That should encourage teams to go for the win more. Funnily enough, the 3 year licence was part of the proposed changes Cookson put forward and ASO didn’t like…. Well, I don’t disagree with everything that the UCI do. Just nearly everything. Have to say, I’m not that bothered by team stability – they come and go. For me, the primary aim should be to avoid having a points system that discourages taking risks to go for a win. I’m sure I would, but my motivation would be to make cycling better, not a more stable working environment for its employees. I fully agree on the different points system. The points should reflect the strict ‘second place is first loser’ attitude that is common in cycling. The mantra of teams with low wage budgets should be “Moneybal” (or Leicester FC if your european). If yo can’t buy the success and need to stay in the top 16 world tour teams get your spreadsheet out and start doing the math.